I've never gotten around to showing the stuff that I do at work, so here goes! 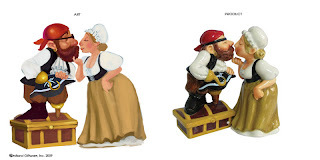 The postings below show some of the art/concepts I developed (left side) for internal and external product lines and how they look (right side) once they're all sculpted, painted, and ready to be marketed and sold at gift stores like Hallmark. I worked on these products earlier this year. I've got more to post, so stay tuned! 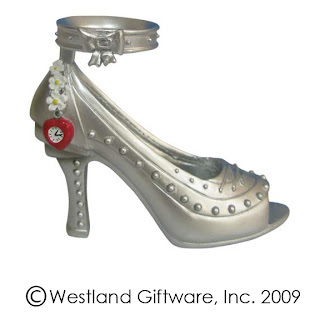 Product Line: The Wizard of Oz, Copyright of Warner Bros.
Project: 70th Anniversary Character Shoe Collection. 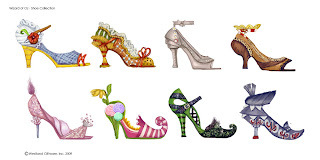 Each shoe was inspired by the Wizard of Oz characters...can you tell which is which? Yo, Jo...hanna! Hmmm... Where have I seen these before? That's right... at Westland!!! I do miss seeing your awesome concept art. Keep it up! wow, i luv'em all jona! Wow these are great! I esp love the lions! So cute!